Always travel with fishing gear: At the end was a rainbow, or two. bygone days melting away with time. 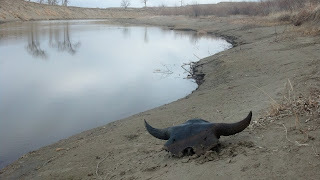 Once I came across a nearly complete skull. 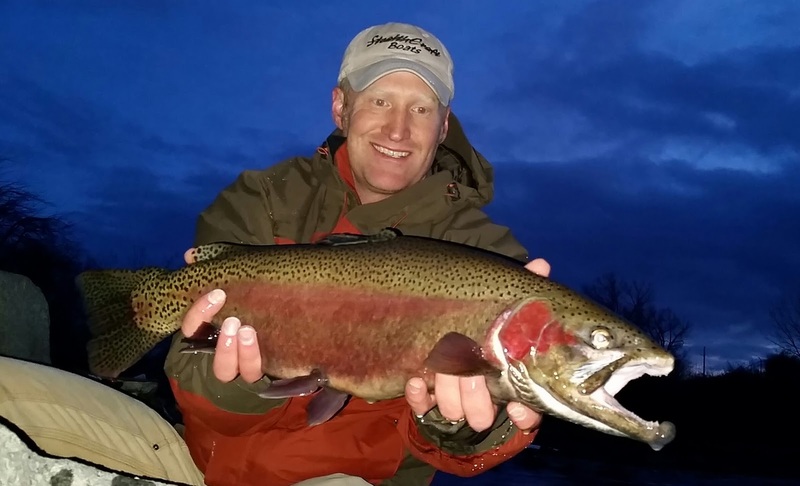 The river is not known as a trout fishery, except maybe in the extreme headwaters. Before today I hadn't personally seen any there. It's hardly known as a fishery at all for that matter. Somewhat obscure, but not unknown. There was only about an hour of daylight remaining when I parked near the water - and I had walleye on my mind. But I have taken pike here as well and thought I might find some this evening. Actually, with the temps in the upper twenties and barely any time before dark, I knew I'd be happy with anything. Heck, even just a chance to walk along icy waters under cobalt-blue Montana sky on a strangely windless winter evening was reward enough for the effort made to carve time from the day. I headed straight to a spot I anticipated would produce some walleye action and worked the hole hard with light line and one of my long nine-and-half foot rods. I rotated through meaty jigs and various retrieves. Resigned to slow action, I started working my way along, picking apart little pieces of structure. I crossed in a shallow riffle and hiked a ways downstream to a long, slow, deeper hole where I've caught northern pike in trips past. I worked it till the sun was very gone. I stowed my rod in my waist pack and started hiking back upstream. When I got to the riffle where I had crossed I couldn't bring myself to leave. So I continued upstream in the twilight covering water I had casted to earlier, but now from the opposite bank where I could reach it better. In a swifter run, one I hadn't really casted to all that much before when thinking of walleye, I picked up my first hit. The hookset was into SOLID fish. The slow, muscular, bulldogish thrashing without-really-going-anywhere gave me visions of a big walleye. The broad red sides were a complete surprise. Disappointment of it not being a walleye wore off very quickly as I slipped my thumb and finger around the tail of the mature buck rainbow - a tail square and stout enough to grip like a baseball bat. I was in awe of the huge trout that I'd never even suspected was there. After a quick couple photos and sending it back on its way I started working that seam more intently with a new focus. Within only the next cast or two I hooked into a second. 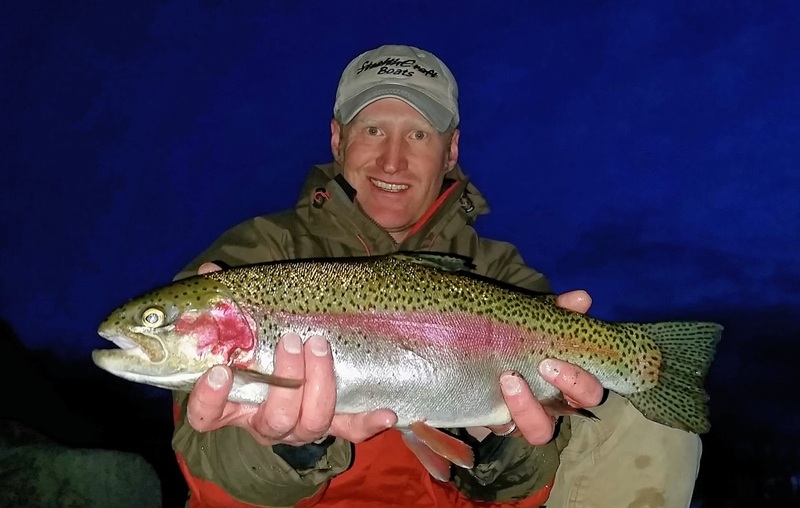 Spunkier and smaller, it was no surprise this go-round to see the pink cheeks of another mature rainbow, this time a chunky hen. I would have been equally in awe of this one if it hadn't been dwarfed by the first. An owl landed on a spindly limb overhead and watched with what seemed like keen interest. When the show was over and the fish was swimming away, he flew off. I could not help but continue to work that run to the head of the hole. I pushed the feathery ice out of my guides and resumed casting to the water that was becoming nearly impossible to see. I really wasn't set up to fish in the dark, but with fish like those I had to see if there were more. But they were the only two to strike. I had been fortunate enough to stick them both and land each of them for pictures. My fingers had been frozen earlier, but now, despite sliding my gloves off to handle the fish and rinsing my hands in the frigid water, I was thoroughly warm. And completely satisfied. Once again, making sure to Always Travel With Fishing Gear had paid off. The key was being there and simply trying, with confidence and persistence. An unexpected trophy had been waiting in lonely winter waters. And like always, I now know more about a river than I did before.